Daniel Lloyd (DFL-Cyclingnews-Litespeed) moved a step towards making Great Britain's team for the Beijing Olympics this week. The British Olympic Association confirmed that his name had been put forward for possible selection and Lloyd knows that good results are vital to achieving his goal next year. Cyclingnews' Gerry McManus met Lloyd at the London Irish rugby club training centre in Sunbury on the famous Thames river just around the corner from his home on a bright sunny autumn day this week. "I haven't been away as much this year as people think," said Lloyd as he watched the Guinness Premiership's side lining up for a team photo. "I have based myself at home this year and I have been commuting to races. There have been quite a few times where I have been at home for up to three weeks training and getting ready for the next event. I think it helps you focus on your next race without too many distractions. I was away in the Tour of Ireland and Tour of Britain at the end of the season though." 27 year-old Lloyd lives in the London suburb with wife Lorraine and son Ralph after he moved from his home in Christchurch in Dorset. He has had one of his best seasons in 2007 after he finished second overall, by just one second, in the Tour of Qinghai Lake and took the silver medal behind David Millar (Saunier Duval-Prodir) in the British national road race championships. "I had marked both of those races as my targets at the beginning of the season," continued Lloyd. "The national champs were postponed because of the floods in June and I was hugely disappointed because I had unbelievable form then. I trained a bit between Qinghai and the rescheduled nationals. I like to have time to prepare for specific events rather than just race week in and week out." Lloyd sets off for a training ride. Lloyd got in some top level racing in the semi-classics with his team early in the season. "I did Gent-Wevelgem, E3 Prijs, Dwars Door Vlaanderen and the three days of De Panne. I really enjoy those races and I got on well. Nico Mattan was the team leader for all of those races. He has won a number of those before and our job was to stick with him for as long as possible. Nico wasn't going so well in the E3 Prijs race and we had a free hand. I finished in the main front group that had split off the front with about 30km to go and it felt really good to make the final selection. It was the first time I had made the crucial cut in a classic race. I didn't quite have the strength to go on the last bit but it is something I would like to focus on next year." "We were racing for the first two months of the season before we got to a race where he wasn't a previous winner." 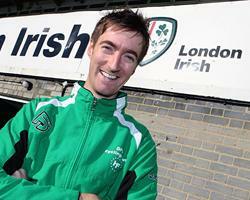 - Daniel Lloyd speaking about his director sportif Eric Vandaraerden. Lloyd had a little time to talk to England rugby international Peter Richards who turned out to be very interested in the cycle racing scene. He also bumped into one of London Irish's newest recruits in Australian Peter Hewat who joined the side from the New South Wales Waratahs. The professional rugby team had called a press conference to announce new team sponsors - something that many cycling teams would dearly love to do. Lloyd already has experience riding in GB colors as part of the under-23 MTB and road teams at the world championships. Staying in a good team and getting in the results will be crucial if Lloyd is to be considered for selection for the Beijing games. Lloyd training on an unusually fine autumn day. "I made a big improvement this year," said Lloyd: "I stepped up a level due to the good winter I had training with new methods. This year I have already resumed my training. I finished the Sun Tour and ended the season much fitter than I have before. I have started training sooner and aiming for another step up again next year." "I had done a lot of work for team leaders over the years but this year I had the responsibility myself at times. Obviously we have got Eric Vandaraerden as our director sportif and he knows a thing or two about racing. We were racing for the first two months of the season before we got to a race where he wasn't a previous winner. It is quite inspiring but he is down to earth guy too." "There are a lot of riders looking for teams for next year," Lloyd explained. "I have been very happy with the team and hope it continues. We have a great race program and if you have any ambitions to going up to the ProTour, which I have, then it is a perfect platform to show yourself in front of the teams and their managers. It would be nice to be settled knowing what I was doing next season. It is great to be recognised by the British federation and be considered for the Olympics and I know I need to get good results that would help get me into the final selection." For more on Lloyd read On the verge. Lloyd talks to Australian rugby star Peter Hewat from Manly. Great weather in sunny Surrey. Daniel Lloyd with English world cup rugby stars Peter Richards and Mike Catt who were in the side that beat Australia 12-10. Bright day in the leafy Surrey suburbs. Lloyd has already started training for 2008. London Irish�s big Bob Casey dwarfs a nearby mountain bike. Lloyd measures up well against beefy Australian Peter Hewat from Manly. Lloyd rode the tours of Ireland and Britain this year.